The story kicks off with what would seem to be a tired and storied series of events leading to the eventual employment of our main character. An arts major turned web designer who is out of work. Oh, if only we could go back to the early years of this century and let all these people know that it just wasn’t going to work out, imagine the place we would be in now. Thankfully, Sloan doesn’t dwell on this subject too much, and the story starts somewhat quickly, although he does seem to dwell on a few major character quirks that don’t seem to resignate to much need as the story moves forward, but are entertaining nonetheless. The story takes place in the great city of San Francisco, a city that is a character in itself. Google is definitely involved in a triumphant manner, as one would assume. 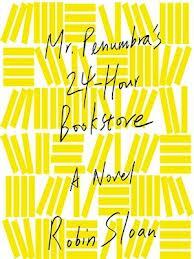 Our hero lands a gig as a bookstore clerk/night watchmen at Mr. Penumbra’s 24 Hour Book Store rather quickly in the tale, but things don’t really start happening until late into Act 2 of the story. We meet a wide array of characters who would eventually shape the foundation of the story. There is the rich friend, the hot Googler girlfriend (who always wears a read shirt, which I envisioned to be the same as Sheldon Cooper’s in The Big Bang Theory, but envision as you like), the weird model building roommate, the attractive yet robot-like roommate (who doesn’t really need to exist, if I were to be frank), and, of course, Mr. Penumbra, the eccentric book store owner who is a whimsical old fellow who really made the story for me. Although I must admit, I read this book in merely an audible sense, and so much credit must be given to Ari Fliakos who did an amazing job throughout the book, but excelled at capturing just how delightful the character of Mr. Penumbra could be. The series of events that occur throughout the novel are almost so entirely site specific that I fear that I may give away much of the mystery and detail that shall arise should you decide to go on the adventure yourself. But it is suffice to say that this is a fun little book that genuinely asks the new age old questions like: Do we know too much? Is there any limit to what we as human beings should truly understand? Is it okay that the amount of mystery in our lives is being shrunk to almost nothing? Questions like this may not arise as you are reading this tale about a loss of fortitude in society, and the gaining of the greater knowledge that we will all die one day, and maybe a (failed?) quest for the key to eternal life is not such a bad way to commute through the very life you have already been given even with it’s restrictions of time. But, when you are finished, if these questions do not arise, you might want to see a doctor to ensure that you are indeed a human being after all. 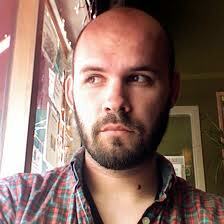 Note: 2014 is the first year for book reviews at Trainwreck’d Society. We will be making a valiant effort to read and review at least 100 books. This is review #1. Be sure to stay in touch and be on the lookout for further reviews throughout 2014. Be sure to let us know if we are falling behind. Enjoy!